On two consecutive Friday evenings, Julie and I have taken a boat ride to the sand with her kayak. There, she takes her kayak downwind while I wade further east into bootie deep water where a "few good fish" can often be found coming upwind in the low sunlight, visible as dark shadows in the clear water. Then, after half an hour or more, I return to the boat and drift downwind and pick up Julie for our ride home. On the way, I have stopped in a favorite muddy lagoon for just a few minutes, to see if the laughing gulls were working over pods of redfish. I entered the lagoon, and stopped immediately in front of several pods of fish under birds. On both days, however, the pods have been comprised wholly of catfish. Knowing that the reds were probably there, too, but not so conveniently marked in the muddy waters, I stepped off the boat and simply observed the melee of mullet, catfish, and barely discernible signs of larger fish. On my first visit to the lagoon over a week ago, while standing and watching, I saw a vague wake and made my first cast. Ten minutes later, I landed a 27+" redfish after dragging it back to the boat for a photo. I released it and we headed home. A week later, just this past Friday, we returned to the same spot and found the same roily conditions with balls of catfish feeding under crazed laughing gulls. There were no obvious signs of redfish, but again I simply stepped off the boat and walked 50 yards and stopped. After a few minutes, I saw the tip of a tail that I thought was a catfish. But not knowing for sure, I casted to it, and stripped the Mother's Day Fly slowly past where its head could have been. I felt a tug, and grimaced, thinking that I would soon have to deal with a catfish at the end of my line. But instead, a fish with considerable authority ripped my line and drove a huge wake in the 9" water. Fifteen minutes later, I landed a 30" red at the boat, took a photo, and released him. I'm not telling you this as a way of bragging. I am telling you because I was amazed. Both felt, from one perspective, like miracles. But from another perspective, they felt as easy and as natural as a laugh. It happens all the time, as Julie has observed time and again. Why is this possible, you might ask? What I experience on the water is what I want my clients and friends to experience. Full immersion. When I enter fully into the natural realm without self-consciousness and ambition, everything reveals itself and everything becomes easy. The Buddhists refer to this meditative process as "stopping and seeing." Both are natural components of experiencing fully. When all agitations have ceased and not a single wave arises, myriad phenomena are clear, without confusion, without obstruction. Thus seeing is not separate from stopping. Once the layers of obscurity have been cleared and no clouding occurs, the ten directions are empty, without stirring, without agitation. But the paradox inherent in this success is that, fundamentally, I don't have any ambition, or at least not very much. I don't much care if I catch a big fish or not. It occurs to me that when a person with sufficient skill and experience surrenders to the moment, everything becomes possible, but nothing is really needed. Randy and I had the pleasure of working together on Saturday to guide Zack Etinger and his buddies Nate and Robert. I took Zack and Nate on my boat, and Randy took Robert; and we headed to the same area where we agreed to fish separate shorelines. We left the dock so early that it was hard to see, and I left my Q-beam at home. Fortunately, the sun was close enough to the horizon that there was a slight glow to guide us. When we turned back west, however, that slight advantage disappeared, so I squinted in the dark as I planed through the opening to a westside lagoon, and shut down 200 yards past the shallow pass that was prohibitively shallow for all boats other than airboats and Stilts. Zack got up on the bow and began blind casting, and then targeting wakes that appeared close enough to be discerned in the low light. After a few casts, he hooked up on the first red. And then Nate took over. It took a while for the reds to begin feeding. That's often case at daybreak: There's a delay and then suddenly you begin hearing explosions all around. We spent almost three hours in the shallow area, where reds continuously exploded on the white shrimp that are starting to mature. There was some tailing action, but the fish were moving around so much that you'd see a tail one moment, and then the fish would shoot away. Targeting the active fish was difficult, but the guys managed to land a few reds before we opted to head east onto the sand. While we were planing across deeper water toward the east side, which was still glassy in the low wind, my oil light came on! I shut down, unclear about the implications since I'm unfamiliar with the Suzuki system. I figured that I was probably safe to continue, but I didn't want to do what I've done before--burn up a powerhead assuming that things were okay when they weren't. So I called Randy, who came over and took my clients onto his Stilt, leaving me to head home. As I got up on plane, and headed toward the ICW, the motor overheated! That's when I concluded that the power head wasn't getting oil. As it turned out, the overheat was probably due to floating grass, and was unrelated to the oil light. After being towed into the County Park, I spoke with my friend Jaime Lopez, who laughed and said, "That was your 100-hour oil service reminder!" Not having read the manual completely :-) I had no idea that the flashing red light was simply a reminder. Well, that's one mistake I won't make again. I've got the manual out, by the way. My bedside reading in advance of three days of guiding this coming weekend. I had the pleasure of guiding Monty Calageros and his 17-year old nephew Michael yesterday. We left the dock before sunrise and headed for a lagoon that has been fishing well, but is completely off limits to most skiffs. Indeed, as I passed three flyfishing guides in a row, I realized that only one of them, who has a Stilt, could possibly be headed to where I planned to fish. Arriving, I took a deep breath knowing that I'd never entered the area at such a low tide. Still, I had confidence in the Stilt. We skated across a thee-inch deep bar that separates the fishable water from the rest of the world and shut down when I thought the boat would float. It barely did. Looking behind me, I could see that an airboat had parked at the entrance to the lagoon. I hoped that he would not come in, because I knew that half the fish would leave the shallow lagoon for deeper water, given the vulnerability of feeding in 6-8 inches of water. For some reason, the airboat captain chose to move on, so we had the square mile lagoon to ourselves for the next three hours. And wow, what a dream venue! We immediate spotted large tailing reds, and small pods of big fish against a grass line, and proceeded to pole further and further into the lagoon. Before we left the area, the guys had landed several above-average reds fishing from the bow of the Stilt, and each caught a red over 27 inches long. We also saw several trophy trout, but those fish eluded us, as usual. I will return there soon, alone. We then went to the sand, and ran north looking for fish. I'd been finding them several miles north of the mouth of the Arroyo for the past few weeks, and expected to find them again. Planing far to the east of where I expected to see them, I turned and planed slowly to the northwest, looking for the signs of the leading edge of the biomass of mullet, ladyfish, redfish and trout. We flushed a couple of reds, so I shut down and poled downwind for a couple of hundred yards. At one point, we seemed to pass over an imaginary north-south line, and began seeing reds. So I staked the boat, assuming that the fish were downwind, and moving toward us. Sure enough, as soon as we began wading, the guys started to see fish. I waded alongside Michael, and was able to help him get his eyes adjusted to the venue. Soon, he was seeing fish 50 yards away, and was able to use his excellent cast to hook and land four reds in a short while. Monty, for his part, caught a couple while wading alongside us. We headed in soon afterward, and celebrated a great day of fishing. I expect I'll see more of Monty in the near future. He's a world-class shooter, high-end firearms expert, and was instrumental in setting up Sportsman's Finest in Austin. But beyond all of that, he appreciates a world-class fly fishery, such as the Lower Laguna. Day after day, I've come in and said to Julie, "It was just a perfect day in every way." That usually means plenty of opportunities, clients who appreciate them, plenty of caught fish, and a certain intangible quality of sacredness that deepens bonds between anglers. Last week, I guided Shaun Daniels again, and two different companions on separate days. 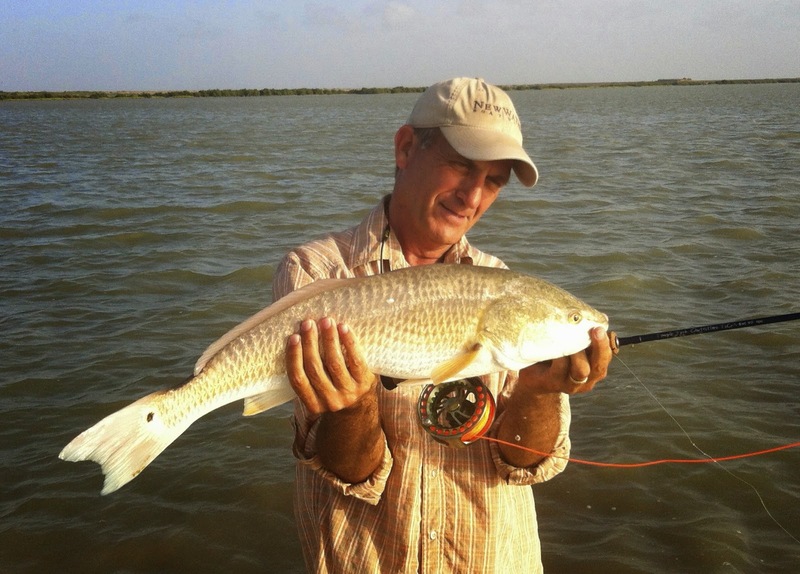 On the first day, Shaun invited his buddy Mickey, who has a place in Port Isabel, and who has fished the Laguna Madre all his life, mostly as a spin fisherman. The forecast called for rain, and for once they were right, unfortunately. We spent most of the day running from two big storms, but never gave up. At one point, the guys were on the sand in the middle of rain without raincoats sight casting as best they could to barely discernible wakes in 15 mph wind. Dripping with rain, they kept going without complaint. I recalled guiding two Israeli brothers several years ago who were casting and laughing in the rain without gear. I said to them, "You are such troopers!" to which they said, "Yes, we are--paratroopers!" By mid-afternoon, we had the bay to ourselves, since most of the boats had "wisely" fled the storms. Mickey and Shaun weren't paratroopers, but they were Texas anglers accustomed to dodging storms and sticking with the program. (By the way, if you haven't read Racing in the Rain, you should do so. A great read, and relevant to the topic at hand.) Such persistence is usually rewarded, sooner or later, and we were fortunate that the reward came sooner. After running around and using most of my gas up, I pulled into a "final stop" and committed to one final pole as the sun leaned heavily against the western shoreline, beckoning us homeward. Suddenly, after a day of east wind, north wind and west wind, there was a hush and the wind stopped entirely. 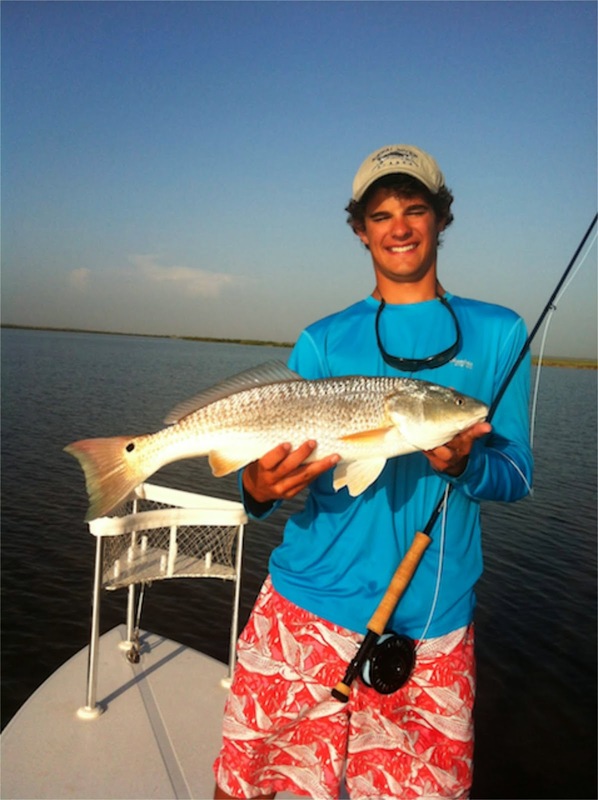 Like a dream, the water turned to glass, and hundreds of redfish, and several big trout began tailing happily. 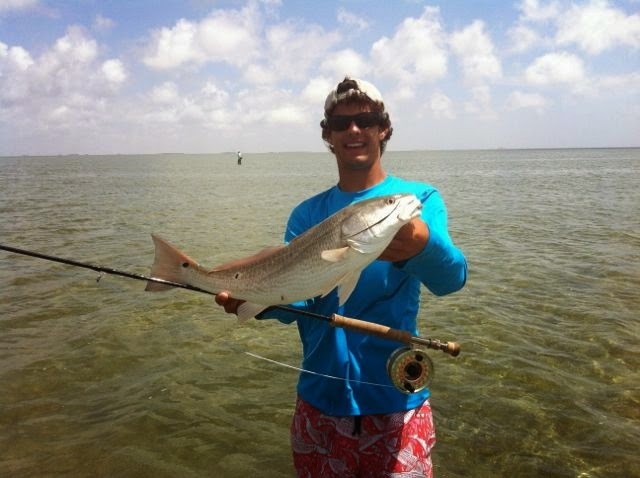 The guys opted to wade, and for the next hour and half they casted to big tails, and managed to land several nice reds. I called Shaun's attention to a school of reds that had appeared nearby, so he hiked over and intercepted 50+ tailing reds, and landed a nice 26+ inch fish. It was a well-deserved ending to an otherwise challenging weather day. Shaun invited Tracey Dean the following day. Tracey also has a place in Port Isabel, even though he lives in Wimberley, as well. 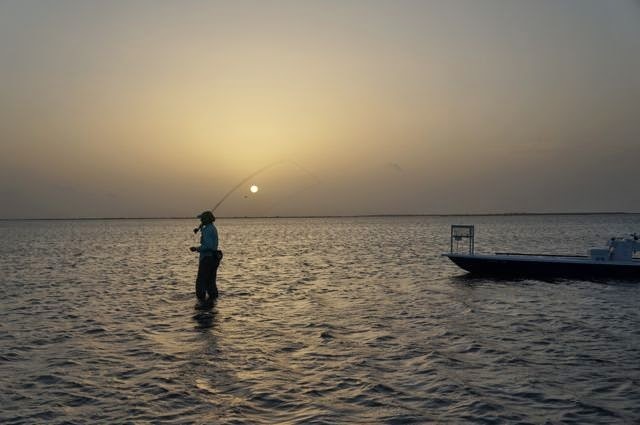 Tracey and Shaun are part of a network of flyfishers who fish together all over the world, and often use me as a guide when they do their weeklong Laguna Madre trip each summer. So I'd guided Tracey and his friends before. Our first stop of the morning was a no-brainer: we returned to the place where Shaun and Mickey had done so well the evening before. And the fish were there in small tailing pods and tailing singles. After catching a couple there, we tried other westside locales fruitlessly before heading to the sand, where we spent the rest of the day. Shaun got into a groove there, and caught several wading while I poled Tracey on the boat. The fish were tough from the boat, though, seeing us at 80 feet out. So, eventually, I picked Shaun up and headed to a new spot where we all waded in crystal clear water under a cloudless afternoon sky. The water looked like a shimmering, expansive piece of topaz. Once we spread out and committed to a wade, the reds started appearing with regularity, tracking upwind and head down, making it relatively easy to get close enough for a presentation. 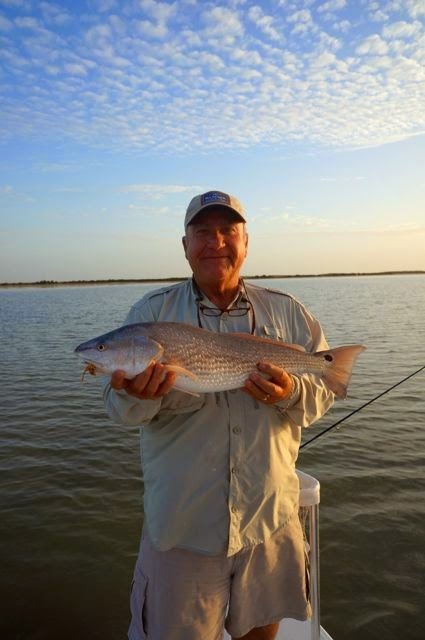 I didn't realize it, but Tracey had never caught a redfish while wading, and he managed to land six nice reds before we headed in. Shaun did well, as well. As we headed in, I believe we all felt that "certain intangible" that forms the heart of religion and enduring friendships. Sometimes we forget that religion means "reconnection." If you look at it that way, we all need it. The past two weekends have offered some extraordinary flyfishing, but in very different conditions. The weekend before last, I guided my old clients and friends Doug and Connie Gauntt who figure prominently in several of my Youtube videos. They are top-class flyfishers, who fish Alaska (for Steelhead), Argentina and Chile each year, as well as fish with me at least once during the summer. As we were heading out a week ago Saturday, I was reflecting on the exotic flyfishing that they do, and said, "This must me a lot less interesting than that." Doug said, "Oh no, we look forward to this trip as much as any of the others." 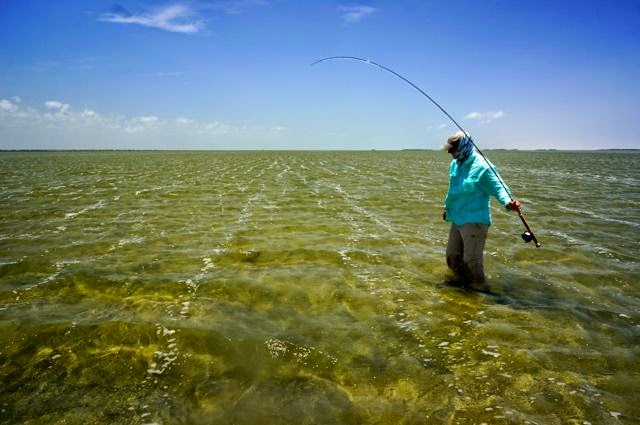 The Gauntts have a feel for the Laguna Madre that has developed over a decade of regular flyfishing. They appreciate the bay in whatever state it's in, and they never, never complain about the wind or weather. Consequently, they are able and willing to adapt to the conditions that we encounter. On the first occasion of guiding Connie, she had never caught a red on her fly rod. It happened to be a terribly windy day and my fellow guide, who was guiding another party of two, got off the water around 11 and took his clients to Mexico as a consolation for such a bad day. 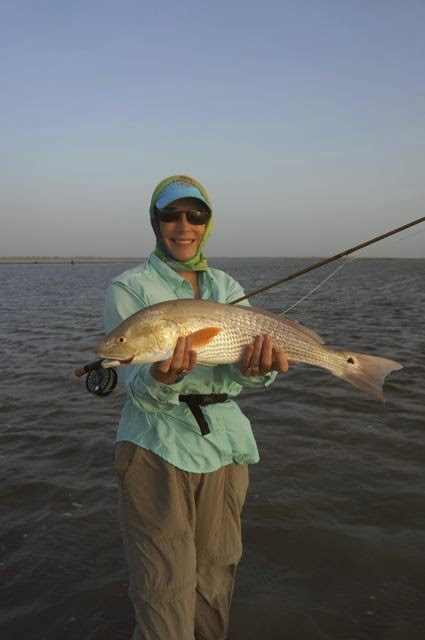 However, we persisted, and by 10 Connie had caught her first red, and by 1 pm, she'd caught her next five reds. She stuck with it, and was rewarded; and that's the name of the game for the Gauntts. When I looked out of the trailer on Saturday morning, I could see that my neighbor's US flag was standing at attention in 15 mph wind. I used to groan at the sight, but I just shrugged and said, It will be interesting. Knowing that the wind was supposed to climb to 25 mph by midday and not let off for the next three days, I figured that I'd better stop complaining and start thinking. When it's that windy at daybreak, it's important to focus on water less than 10 inches deep, so that the fish will be visible even in the wind. 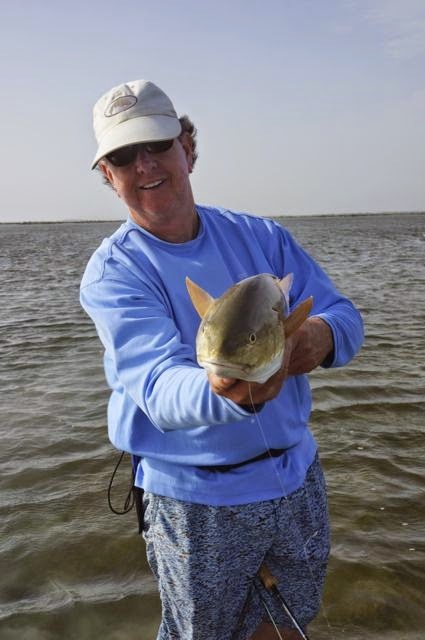 I went into an area that has provided superb redfish action for the past couple of months, whenever the water levels are high enough to support the fish. Sure enough, it was just deep enough to host feeding pods of reds in an expansive area that is off limits to almost all boats. We pushed pods going into the area, and as soon as we came off plane and let the water settle, redfish backs started appearing to the west of us, glowing in the low-angled sunlight. Within a few minutes, Doug was hooked up on the first of six reds that he caught in that spot, while Connie managed to land a fine 25" red before we headed elsewhere. By midday, we were on the sand, where the action was consistently good, resulting in a total catch for our first day of 18 reds. Not bad for a windy day! Indeed, I know a lot of locals who would have stayed home. Perhaps some will read this and learn from a couple of seasoned Dallas flyfishers. The next day was more difficult. When the wind comes directly out of the south, the water clarity is degraded, because there's nothing to break the wind. When it's from the southeast, the wind comes over Padre Island, and will stay clear all day, even when the wind is over 20 knots. We started in the same place, and found the reds feeding there again in fewer numbers in higher wind. But they both landed a couple of reds before the reds dispersed. Then we traveled far to north of the mouth of the Arroyo, where we found a few reds feeding on the sand. By the end of the day, the Gauntts managed to landed "only" 11 reds. I said to them, "I am quite certain that you did better than any flyfishers on the bay." Having seen very few boats out in the fierce wind, I was pretty confident that what I'd said was true. The next day was nearly impossible. No reds in the first locale, and 25+ winds from 9 am onward. Still, they caught a few reds. Overall, it was a great weekend for two master anglers--over 30 reds on days that would have sent most flyfishers packing for an early flight home. A report from this past weekend to follow!